Read Reviews from the New York Times, Jerusalem Post, Jewish Press and More! Even though Leslee’s husband was having an affair with the babysitter, it still took ten years before her husband would grant her a “get,” or Jewish divorce. In the meantime she raised their seven daughters alone. When Ariel sought a “get,” her husband demanded payment of half-million dollars from her father. These are just two of the stories chronicled in Women Unchained, an important new film documenting the experiences of modern-day agunot, or women whose husbands refuse to grant them a Jewish divorce. According to traditional Jewish law, a woman who is an aguna (from the Hebrew word meaning “chained”) cannot re-marry. Among the women profiled are Susan Weiss, founder of the Center for Women’s Justice, who successfully sued in Israeli court a husband who refused for 16 years to grant his wife a get; Sharon Shenhav, director of the International Jewish Women’s Rights Watch, who represented the Israel Bar Association on the commission appointing judges to the Israel Rabbinical Courts; Rachel Levmore, author of the Agreement for Mutual Respect pre-nuptial agreement, who tracks down recalcitrant husbands around the world; and Rabbi Gedalia Dov Schwartz, chief judge of the Chicago Rabbinical Council and the Beth Din of America. Shot in New York, New Jersey, Chicago, Miami, Los Angeles and Israel, Women Unchained includes illuminating interviews with leading women’s rights advocates, rabbis and experts. 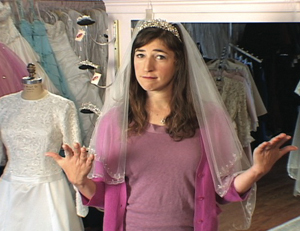 The film provides helpful historical background on the state of women’s rights in Judaism and details of “get-o-nomics” and the outlandish extortion schemes levied against some women. Women Unchained documents the religious court established by the late Rabbi Emanuel Rackman, which frees women from recalcitrant husbands through the issuing of annulments, and the efforts of Brooklyn District Attorney Charles Hynes on behalf of Jewish victims of domestic violence and get extortion. Narrated by actress Mayim Bialik (Blossom, The Big Bang Theory) and featuring an original score by guitarist C Lanzbom, lead singer of Soul Farm, Women Unchained offers strategies for what women can do to protect themselves and why the issue matters to all Jews. GetYourGet is a nonprofit educational website, founded in partnership with the Agunah and Get-Refusal Prevention Project of the International Young Israel Movement in Israel and the Jewish Agency, under the direction of Dr. Rachel Levmore. Created by Layah Kranz Lipsker, with support from the Hadassah Brandeis Institute Project on Gender, Culture, Religion and the Law, the site is designed to educate and support Jewish women seeking a Get, or Jewish divorce.